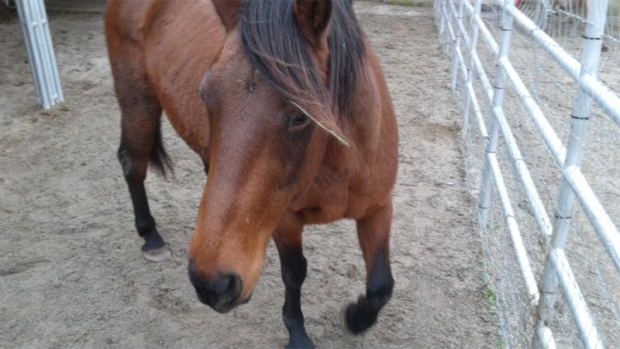 A horse named Ninja is shown in a photo from the BC SPCA. He's starting to learn how to trust people, the society says. Update: At least one of these horses has a happy ending. Read Thor's story here. 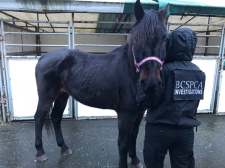 More than two dozen horses are in need of new homes after being seized from a B.C. farm last month. 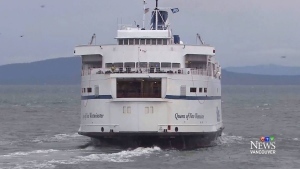 The BC SPCA said 27 of the animals are now available for adoption after receiving initial medical treatments. The horses' conditions vary. They are alleged to have been living among debris in unsanitary conditions at the time of their seizure from a Langley property on Dec. 15. "These beautiful animals were suffering from woefully inadequate care," the SPCA said in a statement Sunday. The SPCA said the horses were seized following a cruelty investigation last month. The investigation is ongoing, and it is not yet known whether the horses' former owner will face charges. When the horses were first examined, they were found to have lice, overgrown hooves, rain scald from not having shelter during bad weather and various untreated injuries, the SPCA said. There was also evidence of poor nutrition and a lack of access to water, the society said. They are now available for adoption, but would-be owners are advised to consider that the horses have been through a lot. Some are just starting to learn to trust people. "Some have emotional and physical scars that will take time to heal and rehabilitate," the SPCA said. In addition to seeking new homes for the horses, the SPCA is also in need of donations. The cost of care and medical treatment for the horses has already exceeded $30,000, and the SPCA expects some of the animals will be in its care for some time. The BC SPCA says Thor, one of the oldest of the rescued horses, is gentle and kind despite what he's been through.